New York, NY – The Multi-School Fossil-Free Divestment Fund, a grassroots collaboration connecting donors to campus divestment efforts, hosted an auction that raised just under $18,000 for the 26 participating campuses. The auction coincided with the Paris Climate talks, connecting local divestment efforts to the larger political problem that is the climate crisis. The total value is now over $50,000–all donations steered away from universities with fossil fuel investments. A growing chorus of students, alumni, and parents are calling on universities to pull their investments from companies whose practices are incompatible with the globally agreed upon 2° C warming threshold. Schools will only receive the donations in the Fund if they heed this call. A collaboration among a dozen members of the Fund, the auction effectively expanded the reach of fossil fuel divestment. Auctioned items included many items related to universities with divestment campaigns: a personalized barber-shop-style “Happy Birthday” from Stanford’s Fleet Street singers, Italian ice with Harvard historian of science Naomi Oreskes, lunch with climate scientist-turned-activist James Hansen, conversation with world-renowned linguist and activist Noam Chomsky, and a Climate Denialist Tour of MIT. Many items reflected the future that climate justice organizers are building: a membership to the Wisconsin Bike Fed, Zipcar gift certificate, Red Fire Farm Locavore Deep Winter CSA Farm Share, family membership to the Aldo Leopold Foundation. Still others were simply delightful: a week’s stay at a cottage on the Isle of White, massages, portrait sessions, and artwork galore. There were items with well-known participants, like a ski excursion with 350.org co-founder and Right Livelihood winner Bill McKibben. As well as lesser-known, like energy insider Sam Brintons tour of congress. Sixteen Boston College students and alumni attended a divestment convergence hosted in Washington, D.C. over spring break, joining thousands of other college students representing over 100 university divestment campaigns. The event, named XL Dissent, took place over two days and culminated in a youth-organized protest of the proposed Keystone XL pipeline. The group is off to a fantastic start; everyone has packed way too much stuff for the weekend (except for the girls, surprisingly). We haven’t even left Boston yet and we’re already having a blast. The Boston area alone was able to completely fill 2 busses of students. This bus is packed. Candy. Pillows. Drool. I think my legs fell off. At the Thurgood Marshall Center in Washington DC leaders of college divestment organizations got together for a strategy session. Students broke up into smaller breakout groups to listen to speakers, brainstorm organizing strategies, and network with other youth leaders. 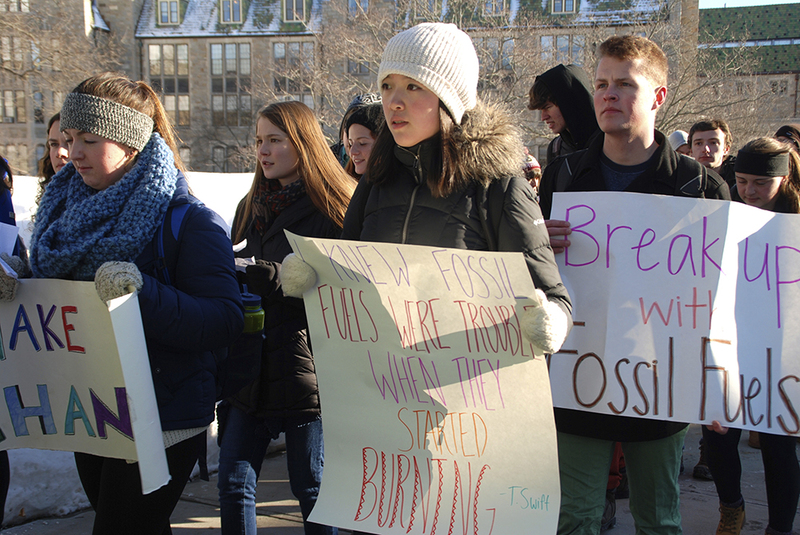 The turnout was twice as large as expected, signifying how fast the national divestment movement is growing in over 300 universities, cities and religions institutions. There is so much power in the room, so much passion for one cause. It is inspiring and energizing. I’m thinking I should try dreadlocks… they seem to be the new style. 500 people attempt to cram into the Thurgood Marshall Center gym. The event will be huge! DC Action Lab arrives and explains the exact plan for the protest tomorrow. Everyone in the room is getting really pumped up and we are confident that our voices will be heard. Side note: The meat line will always be MUCH shorter than the vegan line at an environmental convergence. U Street is awesome, so much to do and see. BCFF is the coolest club on campus with the coolest people and you should join! It is way too early for folk songs but then again it’s too early to be awake in general. About 300 people managed to cram themselves onto St. Stephen’s church floor and everyone wakes up with a ton of energy, ready to get our protest on! The protest begins at Georgetown’s red square. 1,200 students are holding signs, cheering and signing. Hazmat suits and ties are the preferred outfit of the day! This is our future and we will fight for it. We have a voice, it is loud and it is powerful! We march the three miles from Georgetown to the white house. People line the streets to watch and cheer us on! It’s a perfect day and I am surrounded by perfect people. 1100 perfect people who are working together to make an incredible difference. When we arrive at the White House we listen to a series of incredible speakers from leading universities and frontline communities whose tribes and livelihoods will be directly impacted by the KXL pipeline. Xiuhtezcatl Martinez a thirteen-year-old youth representative from Earth Guardians reminded the crowds that this is our future that we are being forced to fight for. Jasmin Thomas from a tribe in Canada spoke of the imminent destruction of sacred Native American land by tar sands extraction. It was clear that we needed to remind Obama why we, the youth, voted him into power. We believed that he would fight for our futures, rather than give up on us and into big oil companies. We needed to remind him of the promises he had made to us in the past. Over a thousand amazing students make their way to the white house fence. 398 of them enter the arrest-able zone and tie themselves to the white house fence or die in the symbolic oil spill. 6 of your fellow BC students were among those to be arrested for civil disobedience. They were incredibly brave and stoic and have earned tremendous respect. When the cops arise to fence off the area they are extremely calm and friendly, joking with the protestors and showing their support of the peaceful student demonstration. When they finally announce that they are going to begin the arrests, the whole crowd cheers. Somewhere, someone in the crowd screams “I love you” and the chant continues as the first protesters are arrested and loaded onto transport vehicles. Not even the cops and tourists can help but be moved by the passionate crowd. The arrests continue until well past 5 pm and the crowds remain to support their friends, peers and heroes. We spill out of the busses onto the quiet Boston sidewalks. We are delirious but freshly energized. Still on the high that comes with acting on something you believe in and realizing that your voice does have power, we make our way back to campus. Quiet and reflective it is clear that this weekend in DC was the experience of a lifetime. We are ready to come back to Boston College with a fresh outlook and new ideas. We have seen what our generation can do when we put our minds to it and we have nothing but the highest of hopes for the BC community. While climate change does pose a daunting challenge for our futures, it also offers an incredible opportunity for leadership and innovation. WE ARE YOUNG, WE ARE POWERFUL AND WE WILL MAKE A DIFFERENCE. How: Sign up for the action here. And the buses from Boston here. We will be leaving on Friday, 2/28 at 11PM for the overnight ride to DC. We will be returning after the action on Sunday, 3/2 for the overnight trip back home, and will arrive at dusk on Monday morning.